Discussion in 'Vegas Trip Reports' started by TechieTripper, Aug 2, 2018. Have an amazing trip!! I hope DEFCON is awesome! That looks great -did they do the eggs right or were they overlooked? Happy travels people! So it’s almost 7am and we are up after a few hours sleep for me GF went to bed early yesterday , jet lag and tiredness didn’t agree with her. I stayed up for a few more hours with no great wins to speak of other than what was posted yesterday. 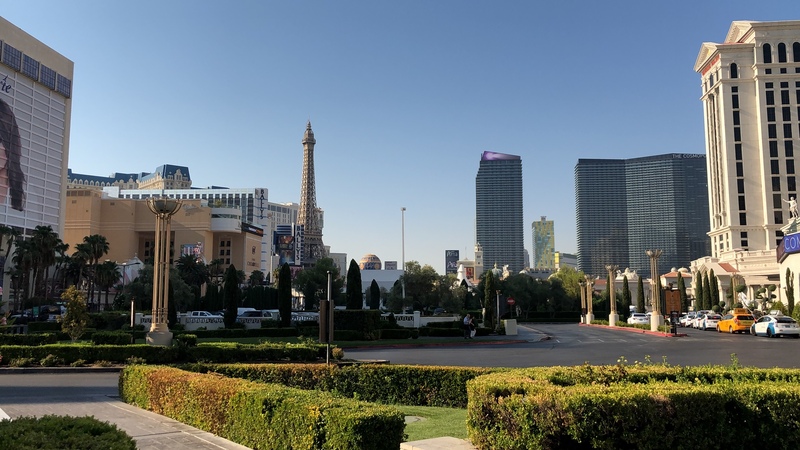 Plan for today is head over to the mirage for the buffet, then have a track up to the Mandalay to collect our conference badges will update along the way!! We went out for a walk early in the morning from TI to the mirage and had the buffet there. We both really enjoyed it however we were absolutely famished!! Had a plate of standard breakfast stuff then an omelette, we thought it was really tasty. 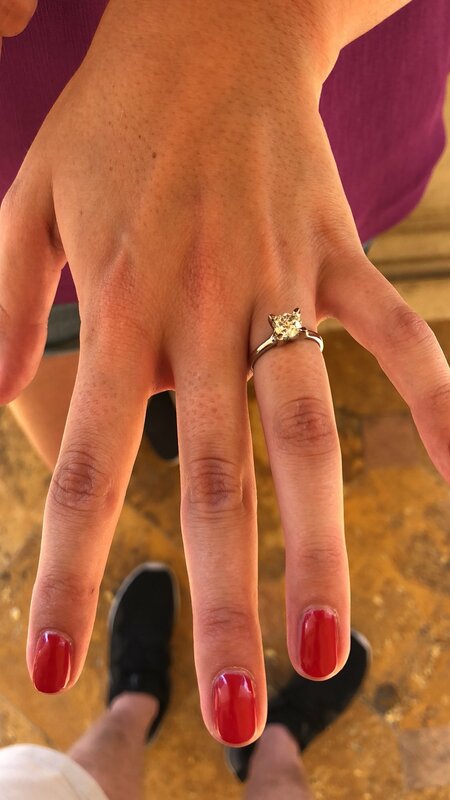 We then wondered to the Bellagio, around the casinos with not much luck, then we walked out of the front of the Bellagio to the right where I decided that it was the time, I proposed and she said YES!! Tears and celebrations for a while as we where calling family back in the Bellagio with a couple of glasses of champagne!! Very exciting ! Slots have not been kind to me at the moment , slotted from the flamingo to Hollywood bowl where we are sat at ocean one in the miracle mile! If you haven’t been here lunch is $4.99 for any meal and 3-1 cocktails which is $10 for 3. Nice frozen pina colada for me and a frozen watermelon for the fiancé (weird saying that). Planning to go back to the room afterwards for a nap until the evening as I am drained!! Congrats on the 3 for 1 drinks ... oh and also the engagement, ha! Nice ring! Congratulations on the engagement. Good luck. Congratulations on your engagement - right on the strip - that's cool. Best of luck on your trip. CONGRATULATIONS on your engagement! Have a great time and good luck to you both. Congratulations on your engagement! have an awesome trip! Congrats on the engagement. Of all the VMB TRs that I’ve read that might be a first, very cool. Keep on having what I’m sure is a great and undoubtedly a memorable trip!! Thank very much for the congratulations everyone ! Had a nice hit on the slot at treasure island and turned $150 free play into $366!! Thank you ghostbusters off to the Mandalay Bay now for an event . It’s 4:39 am and after 3 hours sleep jet lag is still hitting the both of us, we are wide awake! Yesterday evening we got an uber from the TI to the Mandalay, $10 you can’t say fairer than that! We had planned to for to an event at the red square vodka bar but as we walked past we realised it was wasn’t really our scene. Not really that hungry, we walked along through the Luxor, Excalibur, NYNY and all the way along back to the TI. We were slotting along the way but didn’t really have any wins to mention! The Fiancé is a really low roller so was getting wins and losses along the way. I kept playing those damn Willy Wonka machines and doing it impossible to get a bonus!! After walking back to the TI we went to the bar to play some VP and visit our friendly Batman Doug , he is a great laugh and has good stories ! Stayed about even and earned some points, lost a loot $100 on various slots then called it a night as she was falling asleep almost !! We are now both up and pretty hungry , anyone got any suggestions ? It’s not as easy for us to eat as she is Gluten after . Plan for today after food is to go to the MAndalay to pick up our passes , go to Siegfried and Roy secret garden until the evening today .